Pink Dot is the only West Hollywood and Los Angeles market you will ever need. We're best known in Los Angeles and have appeared in several movies and television shows. 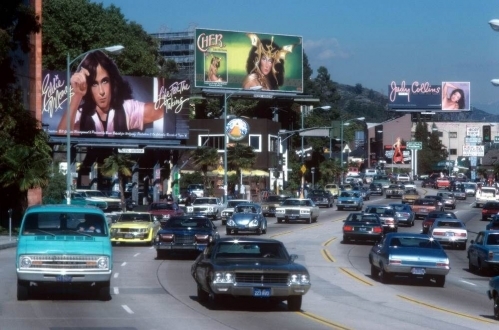 Located on the corner of La Cienega and Sunset Boulevard on the world famous Sunset Strip, for over 30 years, our fleet of VW bugs has been jetting around Los Angeles delivering food, groceries, liquor, and smokes all day and late into the night. We're proud to have formed a deep connection with locals and tourists who can all recall special memories ordering Pink Dot to make their day or night legendary. Open 365 days out of the year, operating from 9 am to 2 am, locals in Los Angeles can have whatever needs they may have met with a 45-minute delivery. Pink Dot was founded in 1987 by entrepreneur Bill Toro. He came up with the idea while watching Jane Jetson of the TV cartoon series “The Jetsons” ordering dinner through her television. By 1999, Toro had taken on investors and expanded the number of locations to 12 throughout LA and Orange County. This rapid expansion put the business on the verge of bankruptcy in 2001. This is when the current owner, Sol Yamini saw an opportunity to save the business that he and his friends grew up using. Yamini purchased the company and restored the Pink Dot name. He eventually closed all but the original, flagship store on Sunset Blvd. to refocus efforts there because it was the busiest of all the company’s former locations. Starting with a new logo, our goal with the rebrand was to pay homage to all the stories of the past while paving the way and appealing to a younger millennial generation. We launched a new website in 2017 with the goal of making our ordering process seamless. Our team is dedicated to sourcing a wide range of products to make sure you can order all your favorite items in one place. The world’s first on-demand, create-your-own cocktail program. With Cocktails on Demand, in around an hour or less, you receive everything you need to make fresh, world class cocktails yourself. We partnered with a chef consultant to take our menu to the next level. Now using Boars Head meat and Clark Street bread, our diverse menu has something for everyone including personal pizzettes, sandwiches, and salads.